The most modern thermal bath of Austria is a combination of fun and action, spa, adventures and relaxation. The Längenfeld Thermal Bath is located next to the homonymous village. Generally the facility is based on the power of opposites. 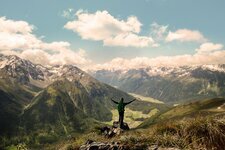 Relaxation in the heart of the Oetztal Alps. The relaxation room at the “Spa 3000 Längenfeld”. At the mossy rockpool the walls are covered with real moss. The bar “Hochsitz” is harmoniously integrated into the lounge area. The Aqua Dome is known as the most modern thermal bath of Austria. Also children feel at ease at the Längenfeld Thermal Bath. Wonderful! Winter at Längenfeld in the Oetztal valley. From the Längenfelder baths (36° C) you can enjoy the enchanting view of the valley. In the Oetztal mineral baths, minerals and trace elements glow beautifully on the skin. The Aqua Dome is characterised by a unique architecture. The outdoor area is especially idyllic when it is snowing. 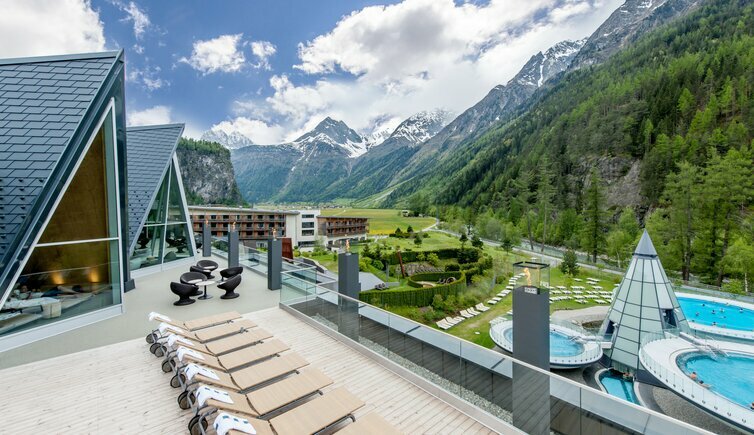 Relaxation in the heart of the Oetztal Alps is what expects you in the Längenfeld Thermal Bath. In a huge glass crystal there are the two indoor pools with warm water (34° C and 36° C), which are directly connected to the basins in the outdoor area. However, three more bowl-shaped basins are located outside: the sole basin with underwater music, the massage basin with thermal water as well as the whirl basin. These pools are characterised by a unique architecture - enjoying them is of utmost pleasure when it is snowing. 12 pools, 7 saunas and a total of 22,000 sqm are waiting for you! The Längenfeld Thermal Bath is also an ideal place to spend a day with your family. The “Alpen Arche Noah”, an area for families and children that is separated from the facility, offers cascade waterfalls, fontains, a swimming pool with sand banks and a 90 m long water slide, attractions which make both adults and children get going! Furthermore, the “Gletscherglühen” sauna world and the “Morgentau” wellness area offer full relaxation with several saunas, hot stone therapy and much more.